Last week, China publicly unveiled its latest and most capable attack drone during the Zhuhai Airshow. 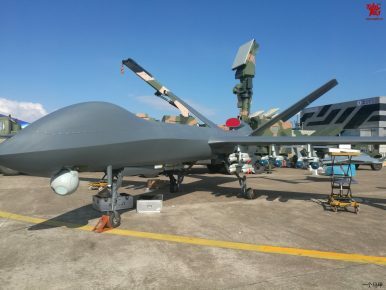 Chinese aircraft maker China Aerospace Science and Technology Corporation (CASC) has for the first time publicly displayed a prototype of its latest and most capable attack and reconnaissance unmanned aerial vehicle (UAV). The Caihong 5 (CH-5), or Rainbow 5, was showcased during this year’s 11th China International Aviation & Aerospace Exhibition held in Zhuhai from November 1 to 6, IHS Jane’s Defense Weekly reported on November 7. According to a senior CASC official, the medium-altitude long-endurance (MALE) CH-5 has a wingspan of 21 meters and can carry a payload of up to 1,200 kilograms (previous reports indicated 900 kilograms), which is 2.6 times more than previous combat drones of the CASC CH series. In total, the CH-5 can carry up to 16 air-to-ground weapons including Lan Jian 7 (Blue Arrow 7) laser-guided air-to-surface missiles, TG100 laser/INS/GPS-guided bombs, and AR-1/HJ-10 anti-tank missiles. The UAV has a maximum take-off weight of more than three tons. The drone’s operating range is up to 250 kilometers via line-of-sight datalink, or 2,000 kilometers when satellite communication is used, IHS Jane’s Defense Weekly reports. However, other reports indicate that the maximum range of the UAV is 6,500 kilometers and will eventually be increased to 10,000 kilometers. The flight time of the CH-5 will also be expanded from the current 60 hours to 120 hours. Furthermore, the CASC official confirmed that the drone will be able to operate autonomously using pre-programmed waypoint navigation. According to the chief designer of the CH series at the China Academy of Aerospace Aerodynamics, Shi Wen, the CH-5 is capable of linking up with other combat drones to conduct joint missions. “Another advantage is that the CH-5 is capable of making a joint strike together with its predecessors, the CH-3 and CH-4, because they can share the same data link and control system. Therefore, it is very easy for current users of the CH-3 and CH-4 to introduce and integrate the CH-5 into their drone network,” Shi said. CASC intends to export the CH-5, including licensing the technology to manufacture the UAV in other countries. “Several foreign nations have expressed intentions to purchase the CH-5, and we are in talks with them,” Shi said. A number of other countries have purchased drones of the CH series in the past, including Egypt and Iraq (See: “Revealed: Chinese Killer Drones in Iraq”). As I reported previously (See: “China Unveils its Largest Killer Drone to Date”), the CH-5 conducted its maiden flight at an undisclosed airfield in Gansu province, China in August 2015. The CH-5’s maiden flight latest for about 20 minutes. It is unclear whether the drone is already operational and in service with the People’s Liberation Army or not. The CH-5 is reportedly equipped with cutting edge technologies including a wall-penetrating radar system capable of identifying targets behind walls and within a building. ‘Terrorists have their hideouts. They can hide in a bush or in a house. That requires us to go through walls and identify the objects inside,’” explained the drone’s chief designer, Ou Zhongming, in August 2015. While CASC claims that its drone is superior to the United States’ MQ-9 Reaper UAV — the CH-5 “can perform whatever operations the MQ-9 Reaper can, and is even better than the U.S. vehicle, when it comes to flight duration and operational efficiency,” according to Shi — it is generally assumed that Chinese combat drones lag behind their Western counterparts in terms of detection capabilities and endurance.